Composed by Jimmy Raney. Jimmy's note-for-note transcriptions from Volume 29 of the Aebersold series. Book. Published by Jamey Aebersold Jazz (JA.JRS). ISBN 978-1-56224-071-4. Transcribed by Jimmy Raney. 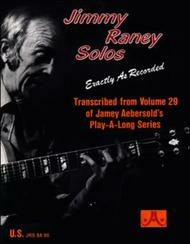 The guitar solos on the Volume 29 "Play Duets With Jimmy Raney" play-a-long CD are so fantastic and inspiring that we put them in book form. These quinessential bebop jazz guitar lines are fun and challenging to play. If you learn just a little of Jimmy's style and technique, you'll be a much better guitarist for it. This is THE perfect companion for the Vol. 29 play-a-long.